The title of this piece is from a statement of Jesus recorded in Matthew 10:16. The full text is, "Behold, I send you forth as sheep in the midst of wolves: be ye therefore wise as serpents, and harmless as doves." Given the traditional vilification of the serpent because of its role in the Genesis story, it is interesting Jesus seems to have studied snakes carefully and must have had great respect for them. I also have great respect for their intelligence and cleverness, snakes have outwitted me on numerous occasions, that's for sure! Despite their reputations as a very low form of life, some have well developed social and family lives-- recent studies of timber rattlesnakes are an example. According to this article and to Ted Andrews (see links at the bottom of the page), some pythons protect and even incubate their eggs. The female coils around the eggs and begins to shiver which raises her body temperature. She may even shuffle the eggs into and out of the sun. He mentions that the python's eating habits teach us how to take in knowledge and power. Its skin-shedding behavior leads to the attribution of "transmutation" in the Medicine Cards (again, see below). The Burmese python, while threatened in its home range, is becoming a problem in this country. People buy these beautiful creatures when they are cute little 18" babies, then rapidly realize their pet is growing incredibly fast into something which is dangerous to family members and other pets. Under ideal conditions, they will become 6 - 9 feet long within one year, eventually reaching up to 20 feet or more and 200 pounds. Few zoos will take them, there is a limit to how many huge snakes a zoo can accommodate. Many of the poor creatures are dumped at animal shelters where they must be euthanized. Worse, people will abandon pets in the wild when they become a problem. Many pets suffer terribly when they are abandoned-- my new little kitty ("Sombrita") is an example: she was skin and bones, starving in her ragged little fur coat when she adopted me. Others like the Burmese python can wreak ecological havoc if released in a suitable habitat. It is a very large, adaptable and aggressive predator and it has already become endemic in the Everglades where it can out-compete our native species not to mention terrifying the occasional hiker or paddler. I'm very fond of snakes, but certainly would not want to stumble across a hungry full grown Burmese! Over 40 were captured in the Everglades in 2004 according to a CNN article, they are breeding and increasing their population there. 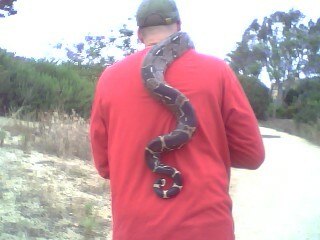 Summer 2009 Update: my friend sent the photograph below which she took of her husband after they caught a nice healthy python at Batiquitos Lagoon in Carlsbad, California. This little fellow looks well fed, doesn't he? He is one lucky guy because he is now on his way to a python rescue organization. How I wish I could convince people not to buy pets they are unable to care for and never to release non-native species into the environment. This necklace pays homage to the beautiful design of the serpent. I drilled a tiny hole in each rib and sewed it to the leather, then covered the stitching by tying the rib on to the hand-beaded leather. A separate strand of vintage "snake" beads (actually old glass beads) recalls the snake's vertebrae. There is no metal in the piece aside from a tiny "Virgo Moon" tag sewn into the back, so it is very soft and lively. Two beaded buttonholes allow the necklace to be worn at different lengths. 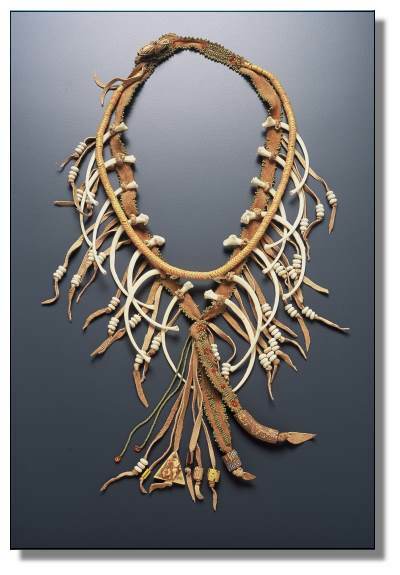 This necklace is featured in Margie Deeb's fabulous book The Beader's Color Palette (see below).